The potatoes are starting to really go gang-busters in one of the towers. The other two are going, but without the same zeal as the one. We think this may be due to the amount of soil in them. 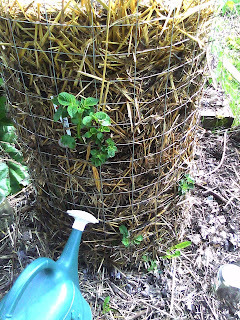 We tried to make sure there was plenty of soil to hold the water, but we may have too much hay/mulch. Next time more care will be taken.